"Ishay Shaer’s playing is a revelation in velvet sonority.... an interpreter who stands in a class by himself"
"A most distinctive release ...The meticulous virtuosity and musical intelligence he brings to these oft-recorded works deserves serious consideration"
Ishay Shaer is one of those pianists that one joyfully celebrates having discovered... fortunately for us, he pursues the individuality of his sound and looks for his own interpretative lines... You will find a noble and deserving companion in this disc, which will transfer you to a territory that is becoming less and less appreciated: that of musical quality as the ultimate goal." "It's easy to see why Shaer is becoming widely regarded as one of the most important, leading pianists of his generation...Shaer is a vibrant, vital pianistic alchemist who injects every piece he plays with passion, soul and a puckish sense of showmanship. Keep your eyes peeled and your ears open; this chap's going to take the world by storm". "[An] exceptional and sensitive performance... Shaer never misses the chance to explore a little deeper"
Young Israeli pianist Ishay Shaer, violinist Liza Ferschtman and cellist Quirine Viersen held the audience spellbound in an almost hypnotic trance. The listeners were so enthralled that they even forgot to cough! Could they have been witness to the birth of a new piano trio? "The technical demands are at the limit of what is humanly possible and Shaer dealt with them masterfully. In addition to the finesse and transparency of his touch, it was remarkable to see how he was able to make the instrument thunder, while achieving symphonic sonorities that seemed to come from the inside of his body. A great pianist". 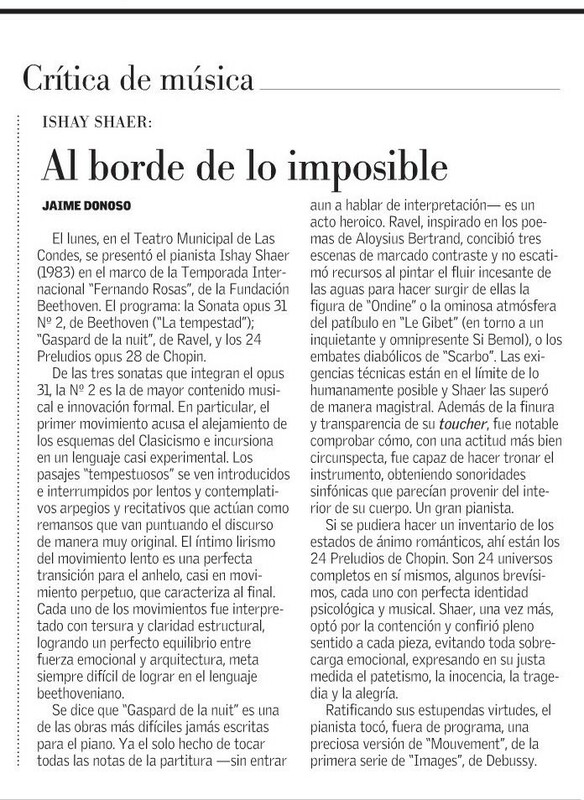 "Ishay Shaer showed a constant rapport with the sonority of the piano, constantly maintaining a dialogue with the orchestra… Impeccable performance in all aspects; technique and virtuosity at the service of [the] work". ..."Everything which the Israeli pianist Ishay Shaer delivered had fluency and grace". "At the piano, a young and brilliant pianist, one of those who you know guarantee impeccable technical reliability and a reading charged with the most deeply rooted musical tradition. Ishay Shaer comes across as restrained, reverential, secure but free of mannerisms... It is not only technique, but rather judgment, and a tempo that doesn't seek the brightness of velocity, but the tranquility of profoundness". "Embedded in the orchestral sound, almost overshined by playful joy, the Israeli Ishay Shaer plays Concerto KV 488 in A Major expressively, with a differentiated touch, a soul deep articulation and a thrilling phrasing. A storyteller who knows his Mozart well." "It was not only a brilliant virtuosic achievement of this demanding work, but also rhythmically gripping, and sensitively conveyed its abundant subtle nuances of dynamics and delicate sound timbres"
"The concert showed astonishing affluence, with excellent playing. Shaer stood out throughout the concert with confident sound and tasteful phrasing"
"Not the meteorological phenomenon, but Shakespeare's last play, "The Tempest", is the programme of Beethoven's piano sonata Op. 31 No. 2, carrying the same title. The 1983 born Israeli pianist Ishay Shaer treats the composer's allusions by "reading" both the musical and the literary texts: Asking questions, providing answers, leading dialogues, meditating, narrating or being impulsively enthusiastic. Ideas that seem as though they develop at the very moment give his interpretation of the piece a persuasive originality. In his "Pianoplus" performance, Shaer played, in addition to Beethoven, also Bach's prelude and fugue in F sharp minor (BWV 883), the last 10 preludes from Op. 28 by Chopin, Liszt's concert etude No. 2 in F minor, "La Leggierezza", and "Gaspard de la Nuit" by Ravel. Especially worth mentioning is the pianist's ability to experience each and every piece at an equal level of authenticity. The excerpt from "The Well-Tempered Clavier" captivates him just as intensively as the gentle autobiographical introspections of the zealous, lovesick Chopin. Shaer handles Liszt's virtuosity calmly and pleasantly, and in Ravel's work he unfolds the entire palette of Impressionism, with the widest range of dynamics. Here, as in Beethoven, he is exceptionally convincing." "The program's highlight was Schumann's Symphonic Etudes... Though an extremely demanding work, the pianist did not indulge in showy virtuosity, despite his impressive technical competence, but concentrated on its formidable aesthetic and artistic qualities. He conveyed its complex and incessantly changing emotional content with utmost sensitivity and intensity"
"Supported by a solid technique, the pianist gave an inspired reading of Schubert, revealing a very clear concept of the subtleties in the first "Allegro ma non troppo"... [and] concluded with a brilliant interpretation of the final "Allegro giusto"... There is no room for doubt, Shaer has a brilliant career ahead of him".